“Over the past 10 years, the Democrat majority have been intent on pushing through dramatic tax increases, and irresponsible budget gimmicks to fund an insatiable desire to spend taxpayer dollars. It is no coincidence that during this same period it was the first time in recorded history where the state had less private sector jobs at the end of the decade than we had at the beginning. Senator Steve Oroho (R-24) issued the following statement today after the Senate passed S-2937, comprehensive pension reform legislation. Included in the bill is a provision that will prevent elected officials from collecting two public checks at the same time for the same job. “Since my first days in the Senate I have been pushing to close a loophole in our state’s pension system where elected officials may collect a pension, while continuing to receive a salary in the same elected office from which they supposedly retired. I believe that on pension reform, we, as elected officials, must lead by example or we lack credibility. “Although my bill was held, I was assured by Senate President Sweeney that the effort to end this pension loophole which I’ve been continuing to champion will be considered in the larger context of the comprehensive pension reform proposal. 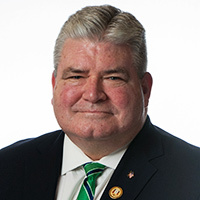 Legislation sponsored by Senator Steve Oroho (R-Sussex, Morris, Hunterdon) that would prohibit the practice of elected officials taking their pension, while continuing to receive their salary in elected office from which they supposedly retired was passed by the Senate Budget and Appropriations Committee today.